I go to work at 6:45 AM most days. So the change in the weather has been delightful. I won't lie, I might have dug out some cozy hoodies and kissed them as I brought them back into rotation. It's been downright chilly the last few days, and I'm thrilled. So...Yay, right? Of course, it's not so easy. By noon, it's summer again, hoodies tossed to the side, or jackets, or sweaters, and we're rolling up our sleeves and wishing for another layer of deodorant. So what to do in the in-between season? Let's look at three timeless items that will carry you through the in between season and beyond and never, ever go out of style. The Trench Coat: Ohhhhhhhhhhh. Oh the trench coat. Is there a more perfect, classy, sharp article of clothing in all the land? There is not! 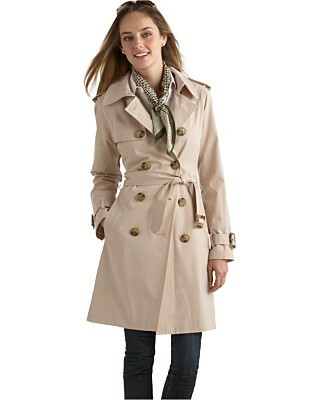 I love the timeless look of a well fitted trench, and they are absolutely everywhere in early fall. Not too heavy, not too light, super good looking, and perfect in pretty much any color (I'm partial to the classic camel, but that's just me) it's a piece of clothing you want to invest in. It will never go out of style, and it's an absolutely vital part of any wardrobe. Perfection. The Scarf: Now, the scarf can go either way. 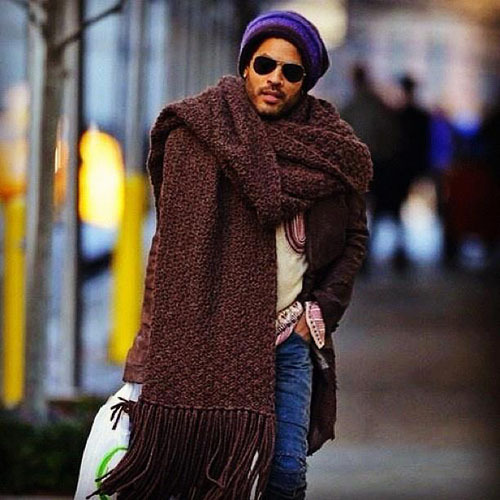 There's room for playing with colors and textures with scarves, and a simple tutorial on how to drape or tie one goes a long way, so it's versatile as all get out, but you don't want to get too out of control or you'll end up looking like Lenny Kravitz, and wearing your duvet cover as a scarf is not the way we want to make a statement without saying a word. Look for a contrasting color to your jacket. If you wear a black fall jacket, mix it up and go for a jewel tone. if your jacket is patterned, go for a solid color that doesn't clash, an ivory or black scarf cannot go wrong, no matter what you're wearing. Scarves are supposed to be fun, and they're usually really affordable, so mix them up and grab a few. Just don't do what Lenny did here. That's for him and him alone. The Hat: If the scarf is versatile, the hat is your oyster. There are so many different styles of hats that I could never put them in one article. You may knit hats, and that's awesome! That way you can make a unique style just for you. But if you're looking for a classic hat that will never, ever go out of style, I would definitely go with the cloche. What's a cloche? Let me show you, you'll know immediately what I'm talking about. Yes, THAT kind. That 1920s era kind of stylish bucket hat. (Cloche is such a prettier word than bucket, yes?) We're talking about a style that has not been "out" since it was popularized about 100 years ago. They're in felt, wool, crochet, straw, and you can get them anywhere from Amazon to Target to Nordstroms. They look fabulous with any hairstyle that lends itself to hat-wearing, and they're so, so elegant. You can dress them up or down, and they'll never go out of style. The cloche, people! There you have it. A trench, a scarf, and a cloche. You're READY for the in-between season. Bring on Fall!